Great grandmother Diane Snyder moved into a new home in Jackson last month. 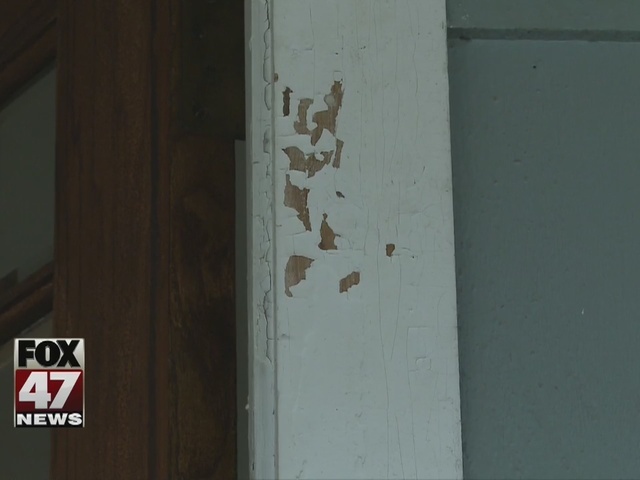 "I don't know what year this house was built, but I know the paint is chipping badly," said Snyder. "We are going to redo it." That's because she's concerned that her great grand children could be exposed to lead in the paint. "Any house that was built before 1978 likely has lead paint in it," said Jackson Vice Mayor Derek Dobie. "That lead paint can get into our bodies, particularly children's bodies through you know eating lead paint." Recent numbers from the state show 67.9% of homes in Jackson County were built before 1978, and 6.4 percent of children tested have a blood lead level higher than the state's action level. "Lead can affect all parts of the body," said Chief Medical Examiner Dr. Eden Wells. "But the most sensitive part that lead can really impact is the nervous system in the brain development." The city says it's been demolishing foreclosed, vacant, or abandoned homes, spraying it with water afterwards to make sure there's no lead dust left behind. "Getting into the home before we start to tear it down and hosing through all the walls, hosing out the attic making sure that we're cleaning up after ourselves and putting two hoses on the home during demolition," explained Dobies. So lead contamination doesn't get into the air or surrounding community. "Remove lead from the environment and also provide resources so we can provide education, nutrition, good healthcare," said Dr. Wells. "We can actually counteract the long term effects." Effects Snyder says she hopes her great grandchildren won't have to deal with. "I'm really concerned," said Snyder. The city says its water has never exceeded the EPA's lead guidelines. It's going to check lead levels every year instead of every three years, and it will test twice as many homes as required.